Marriages for William Greene Jr.
Sources for William Greene Jr.
2 Roelker, William Greene, Benjamin Franklin and Catharine Ray Greene: Their Correspondence 1755-1790, Philadelphia: American Philosophical Society (1949), pp. 30-31, Marriage of William Greene Jr. and Catharine Ray, Internet Archive (Digital Library). 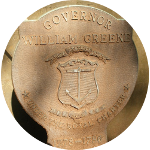 3 Wikipedia, "William Greene (governor)", (accessed 12/02/2014).